Fennel was one the first wild edibles I learned about in California. Its unmistakable licorice-like scent is intoxicating. When in doubt, just break a stem and take a whiff. If it smells like licorice, you’ve got wild fennel. The plant sends up four or five smooth stalks which are hollow with a white pith. The leaves are feathery and fluffy poofs, finely divided linear foliage that look a lot like dill. Flowers bloom in large flat umbels of golden yellow tiny little flowers. These flowers eventually ripen to gray-brown seeds. 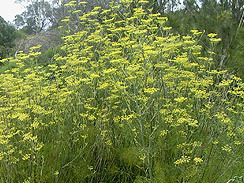 Wild fennel can reach just under 6 feet in height. They grow singly along trails or in huge clusters out in open fields. 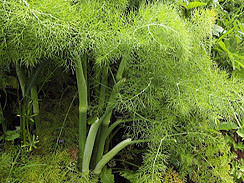 Wild fennel (Foeniculum vulgare) was originally native to Greece but has spread over much of the world. It’s been established here in California for about 120 years, and has by now become a native itself. I’ve personally harvested fennel from Humboldt County to Malibu. 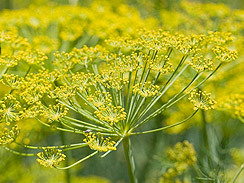 The entire wild fennel plant is edible, including stalks, leaves, flowers and seeds. The leaves are often used in pasta, soups, to flavor fish, etc. Stalks, leaves, and seeds are used to flavor tea, and the seeds can be dried and stored for use as a spice. Leaves are used to flavor home-cured olives. CAUTION: be sure not to confuse this plant with Wild Parsnip which has a similar yellow flower head. The parsnip’s leaves are not fluffy dill-like tufts, however, and it does not smell like licorice. Sap from wild parsnip plants can cause severe and excruciatingly painful skin reactions. Blend dry herbs to taste, mixing enough for later use. I usually mix about 2 cups at one time. My mix is caffeine free, add tea leaves if you’d like caffeine. Put 1 tsp of dry herb blend in tea strainer, add to saucepan with 2 cups water. Add fresh ginger and wild fennel. Slowly bringing mix to low boil then simmer for about 15 minutes. Place milk in microwave-safe tea mug with 1 tsp sugar or honey, heat on high until milk foams. Remove hot foamy milk from microwave, then fill mug to the brim by adding hot chai mixture. Yuuuuummmmyyyyyy. If you did it right, you’ll have one of the spiciest chais ever. The ginger is a natural stimulant, but no coffee jitters.